The winter season is no time to forgo foraging. Plenty of food can be harvested from the winter landscape – for example, these crabapples (Malus sp.). Sure, they may not look as exquisite as they once did a few moons ago, nor are they as large and unblemished as the variants of Malus we find in the grocery store. These, however, have character – a disposition uniquely carved by wind, ice, and snow. 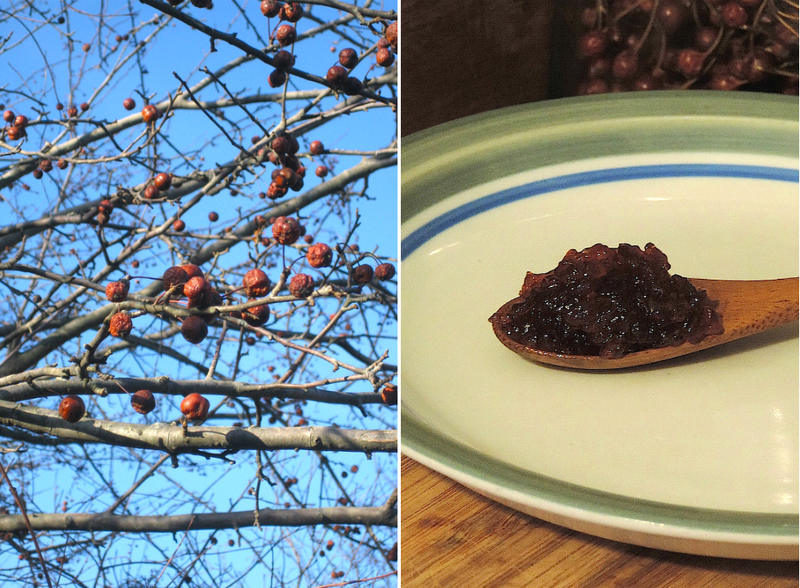 To enjoy these fruits, I decided to create a crabapple jelly. Cinnamon, cardamom, and a splash of maple syrup were all that I added to the recipe, and the natural pectin was enough to produce the desired thickness. Beyond edibility, crabapples are packed with nutrition and medicine. The deep red and purple pigments found within their fruits, leaves, and flowers owe their colors to antioxidants known as anthocyanins. Necessary for the plant’s survival, these antioxidants are essential for optimal functioning within our bodies as well. Quercetin, a flavonoid in crabapples, has been shown to possess anti-cancer, anti-viral, anti-inflammatory, anti-bacterial, and muscle-relaxing properties (Jan et al., 2010). Additionally, pectin – the gelling polysaccharide – has been shown to demonstrate cholesterol and triglyceride lowering activities (Boyer et al., 2004). No need to lament the changing season … enjoy the winter harvest for all that is offered! Crabapples and other fruits can still be gathered this time of year in western Pennsylvania, offering – in addition to their nutrition and medicine – tenacity and resilience built from their wild environments.